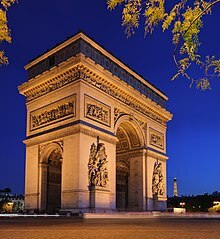 The Arc de Triomphe de l'Étoile is ane o the maist famous monuments in Paris. It stands in the centre o the Place Charles de Gaulle (oreeginally named Place de l'Étoile), at the wastren end o the Champs-Élysées. ↑ Raymond, Gino (30 October 2008). Historical dictionary of France. Scarecrow Press. p. 9. ISBN 978-0-8108-5095-8. Retrieved 28 July 2011. ↑ Fleischmann, Hector (1914). An unknown son of Napoleon. John Lane company. p. 204. Retrieved 28 July 2011. ↑ The étoile ("star") is formed bi twelve radiatin avenues. This page wis last eeditit on 11 Mairch 2018, at 00:39.